Today just about everyone uses a smartphone for voice, texting, keeping in touch with social media, using maps for navigation, and other Internet data. Many people also use tablets for reading, doing work, social media, etc. Tablets are great for traveling because you can bring along all your books on one device rather than lugging around heavy and space consuming paper books. We take for granted our ability to just be online, with high-speed bandwidth, through our cellular provider’s 4G/LTE network. Most people have plans now a day that have unlimited voice and texting. We are not worried about roaming or overage charges for data usage because of large inexpensive data plans. But what happens when we are traveling abroad? Most modern smartphones and tablets can get access (roam) on foreign networks because they are made with multiple frequency abilities. IPhone’s and most Android phones can work anywhere in the world. This great for those that travel international to be able to bring their personal phone and not having to buy or rent a phone for travel. What about the charges to use your device while traveling abroad? Even though most cellular providers offer special international roaming plans they can still be very expensive to use for voice calls and they typically don’t offer much data for texting or using the Internet. Try sending or posting a few family vacation photos and you just about reach your limit before you even have spent a few days on your vacation. The obvious advice is to turn off your devices roaming ability and to use Wi-Fi Hot Spots as much as possible. While this is great advice it can also be inconvenient and not always feasible. In some countries there can be very limited Wi-Fi Hot Spots available. Most hotels and vacation rentals have Wi-Fi for their guest to use for free or part of the price to stay. This is fine when you are at your accommodations, but what about when you are out and about? What if you need to look up your location on Google Maps, want to find a good restaurant, need to respond to an email, or want to post that amazing family selfy on social media for the world to see? Although it’s good to have a good roaming plan from your cellular provider prior to traveling abroad, there are some easy and cost effective way to provide Internet connectivity for yourself or the whole family. To get the best local coverage and to have the best rates for both voice and data is to buy a local prepaid SIM card for the country you are visiting. Prepaid SIM cards can be found at kiosks at airports, seaports, train stations, or in large shopping stores and markets. You can get ones for both voice and data or for data only. Typical costs for a prepaid SIM can range between $15 to $40 depending on the amount of data you buy. You can get in Europe a 2GB SIM that is good for one month for about $30. If you need more data you can easily “top it” or buy another data bundle. To use a prepaid SIM you will need an unlocked device (a device that has been unlocked from exclusive use of your cellular carrier). There are tons of articles on the Internet on how to unlock a phone, but be sure to check with you provider to make sure you are not violating your contract and service. In many places you can also rent a local phone. You just need to be sure to return it in good condition and avoid loosing it or you’ll face a large charge. A Mi-Fi devices can provide inexpensive Wi-Fi connectivity for the whole family! 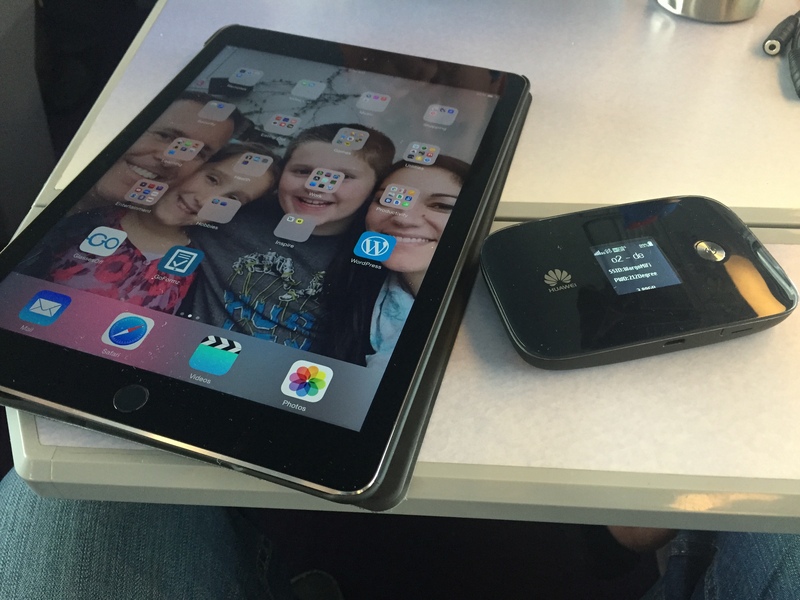 A real convenient way to get data while traveling abroad is to bring along a Mi-Fi device. A Mi-Fi device is a small device that you put a local SIM card in that allows the device to connect to the local cellular 3G or 4G/LTE data network and it provides Wi-Fi access. Basically your very own Wi-Fi hotspot that can fit in your pocket. There are many companies that you can rent a Mi-Fi device from (they typically come preloaded with a SIM and a data plan) that will ship it to you before you leave on your trip. If you travel several times a year it can be more cost effective just to buy an unlocked Mi-Fi device so all you’ll need to do is buy a local prepaid SIM when you get to your location. A typical Mi-Fi device, that fits in the palm of your hand or can easily fit in your pocket, can connect up to 10+ devices (phones, tablets, laptops, game devices, etc.). This is great when your family has multiple devices. With your smartphone connected to the Mi-Fi you can make VoIP calls (using Skype or YouRoam) saving you a lot for voice calls, keep from getting lost by using Google Maps, find a great attraction using your favorite travel app, or post those great pictures to you social media accounts.